A painting assumed to be an imitation of one of Renaissance painter Sandro Botticelli's most famous works has been revealed to be an original from Botticelli's own studio, according to the conservation charity English Heritage. The work is a copy of Botticelli's Madonna of the Pomegranate, which was painted around 1487 and is housed in the Uffizi Gallery in Florence, Italy. The copy was previously believed to be a fake from a later era because a thick layer of yellow varnish over the canvas had obscured the work's true quality for more than a century. Conservators discovered the true origins while the painting was being cleaned. After X-ray testing, pigment analysis and infrared studies of the artwork, they concluded that the painting was, in fact, created in Botticelli's own workshop. 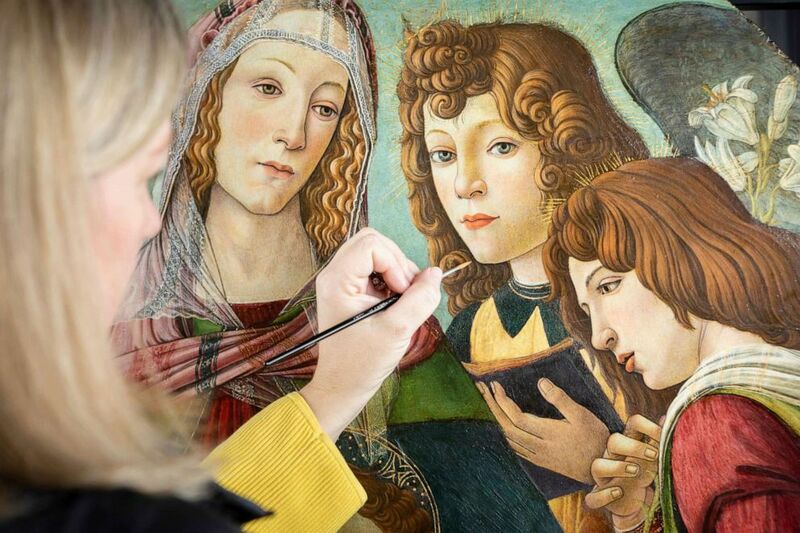 English Heritage Conservator Rachel Turnbull completes the conservation of "Madonna of the Pomegranate", a painting revealed as a rare example by the workshop of Botticelli, pictured made available March 28, 2019. In the 15th century, Botticelli hired a number of assistants at his workshop in Florence, Italy, to help him meet the popular demand for his paintings. Art collectors and painters would often request copies of his popular works, hence why this "copy" can be considered an original Botticelli. The copy, described by English Heritage as "the closest version of the masterpiece" to the real thing, was bought in 1897 by art collector and diamond magnate Julius Wernher before later falling into the conservation charity's catalog. The painting shows the Madonna and the figure of Jesus Christ flanked by four angels. Rachel Turnbull, English Heritage's Senior Collections Conservator, said she believed the painting was too similar to Botticelli's original works when she first laid her eyes on the copy. "Being able to closely examine and conserve this painting for the first time in over 100 years has really given us the chance to get up-close and personal with the paintwork," she said in a statement. "I noticed instantly that the painting bore a striking resemblance to the workshop of Botticelli himself; stylistically it was too similar to be an imitation… After consultations with our colleagues at the Victoria and Albert Museum and the National Gallery London, we are finally able to confirm that Madonna of the Pomegranate is from the Florentine workshop of master painter Sandro Botticelli." The authentic copy to the original can now be seen in Ranger's House, London, where it will be on display starting April 1, along with over 700 other works of fine and decorative art collected by Wernher.